Exceptionally high reaction gains of hydrogen protons measured with the boron isotope 11 are compared with other fusion reactions. This is leading to the conclusion that secondary avalanche reactions are happening and confirming the results of high-gain, neutron-free, clean, safe, low-cost, and long-term available energy. The essential basis is the unusual non-thermal block-ignition scheme with picosecond laser pulses of extremely high powers above the petawatt range. Fusion energy from reacting hydrogen (protons) with the boron isotope 11 (HB11) resulting in three stable helium nuclei, is without problem of nuclear radiation in contrast to DT fusion. But the HB11 reaction driven by nanosecond laser pulses with thermal compression and ignition by lasers is extremely difficult. This changed radically when irradiation with picosecond laser pulses produces a non-thermal plasma block ignition with ultrahigh acceleration. This uses the nonlinear (ponderomotive) force to surprizingly resulting in same thresholds as DT fusion even under pessimistic assumption of binary reactions. After evaluation of reactions trapped cylindrically by kilotesla magnetic fields and using the measured highly increased HB11 fusion gains for the proof of an avalanche of the three alphas in secondary reactions, possibilities for an absolutely clean energy source at comptitive costs were concluded. Energy generation from laser driven fusion of deuterium D with tritium T (DT) arrived at highest fusion gains at the NIF project by using indirect drive using up to 2 MJ laser pulses of about nanosecond duration where the thermal processes with ablation-compression and spark ignition are involved. A similar option with direct drive and volume ignition is being studied for thermal driven laser-fusion with nanosecond laser pulses. This is in basic contrast with using picosecond (ps) laser pulses with needing energy fluxes E* of about 100 million joules per square centimeter for igniting uncompressed solid density DT. Initiated by Chu, a non-thermal energy transfer from laser energy into plasma blocks is used to avoid complicate thermal determined mechanisms of the nanosecond interaction. This is possible now through the Chirped Pulse Amplification CPA of laser pulses of picosecond and shorter duration with powers above petawatt (PW). The ultrahigh acceleration of the plasma blocks was theoretically-numerically predicted in 1978 and measured in agreement with the theory. The advantage of the picosecond-block-ignition arrived at the surprising result, that the environmentally clean fusion of protons with the boron isotope 11 (HB11) is possible at similar thresholds as DT, while thermal ignition was considered as impossible with needing compression of HB11 to more than 100000 times solid state density. Next steps of these developments focus on the combination of these results with cylindrical trapping of the fusion reaction with ultrahigh magnetic fields of about 10 kilotesla and by using the measured highly increased gains of HB11 fusion as an avalanche ignition process. Based on the computation of block ignition by a picosecond laser pulse 2 of 10^20W per centimeter squared intensity on a solid HB11 cylinder of 0.2mm diameter within a 10 kilotesla magnetic field shows a slow radial expansion against the trapping and an axial propagation of the reaction with several thousands of km/s velocity during about a ns. With avalanche reaction, the cylinder is nearly completely reacting producing more than one gigajoule energy of alpha particles by the irradiated 30 kJ laser pulse 2. Estimations about preliminary parameters for HB11 fusion generation. Following the results for a reaction scheme, a picosecond laser pulse of 30 kilojoule energy (30PW power) should produce more than a GJ energy in clean alpha particles. The technology for the needed laser pulses is close to availability in view of 200 PW-0.1ps laser pulses to be produced using the developed NIF-technology. Figure 3 describes the scheme of a fusion reactor for converting the energy of the alpha particles into an electrostatic pulse in the range close to 1.4 megavolts using the technology of high voltage direct current HVDC power transmission electricity. It was estimated for a power station working with one reaction per second, that after deducting the costs for investment and operation, the energy of the value of up to $300Million per year may be produced for the grid. Initially, they performed their numerical simulations only for plane target interaction. However, when they used spherical and cylindrical geometries an ultrahigh magnetic field in the 10 kilotesla range trapped the block-ignited HB11 plasma, such that elastic collisions of the alpha particles transferred about 600keV to the boron nuclei. These nuclei have very large cross sections for secondary HB11 reactions, increasing the gain and resulting in avalanche multiplication (multiplying the number of charge carriers). They made approximate calculations for these results and confirmed the avalanche process by experiments. They calculated that 30PW picosecond laser pulses with 30kJ energy irradiating a solid cylinder of HB11 fuel of centimeter length and millimeter radius in a 10 kilotesla magnetic field may produce more than 280kWh electric energy (worth about $28). The calculation assumed a spherical reactor of more than 1 meter radius around a central reaction unit that is charged to −1.4 million volts. This voltage stops the generated alpha particles and converts their kinetic energy into electric energy. A very small fraction of this energy is needed to drive the lasers, and we further estimated costs of about $18 per shot associated with replacing the HB11 fuel and the reaction unit (which is destroyed each time) and recharging it. At a rate of one reaction per second, the generated electricity would produce a net income of over $300 million/year. This money should cover the investment and other running costs of the power station, perhaps with a good profit margin. Such a reactor would be a clean, safe, and low-cost energy source. 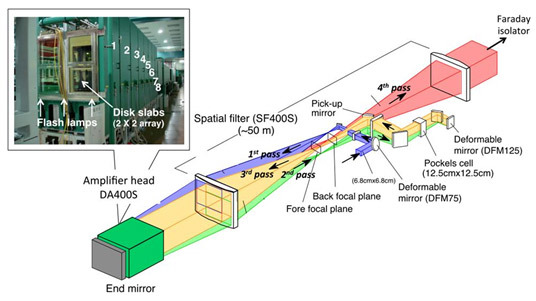 Researchers at Osaka University are claiming to have fired the most powerful laser in the world. The 2-petawatt (two quadrillion watt) pulse lasted just one picosecond (a trillionth of a second). The team was using the huge “LFEX” (Laser for Fast Ignition Experiments). The LFEX is about 100 meters long, including the observation apparatus. The four set of devices to amplify the laser beam were completed at the end of last year. In the experiment, energy was applied to special glass using devices that were basically lamps resembling ordinary fluorescent tubes, repeatedly amplifying the power of the beam. The team held experiments continuously and confirmed this month that a record has been achieved. “With heated competition in the world to improve the performance of lasers, our goal now is to increase our output to 10 petawatts,” said the institute’s Junji Kawanaka, an associate professor of electrical engineering at the university. Michael Donovan, associate director for the Texas Petawatt, says that it’s important to remember when talking about lasers of this size that, while the power output is immense, the energy used is actually very little. The scientists at Osaka University claim that their pulse (2 petawatts at 1 picosecond) is about 100 times the energy of UT Austin’s laser, and twice its peak power. “The energy of the Texas Petawatt, 150 to 200 Joules, is about that in a cup of coffee or a very hard tennis serve,” Donovan said via email. ”It is the energy used by a 100 watt light bulb in 2 seconds.” Power is energy over time, and since one picosecond is a very small amount of time, the power output turns out to be immense. 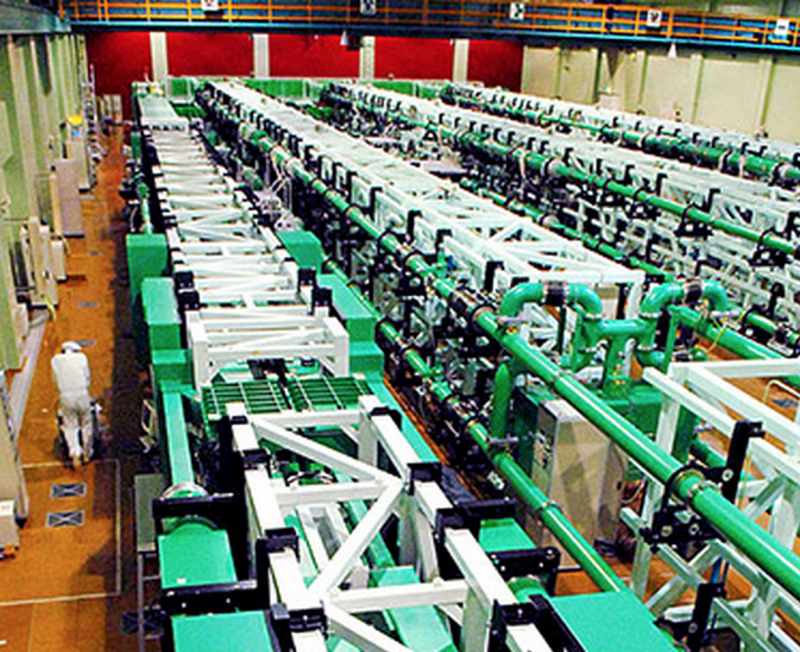 The University of Osaka, which is now working on a 10-petawatt laser.